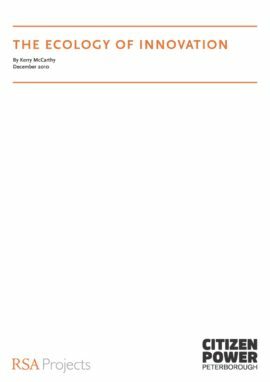 Paper formally acknowledging the flaws in the original DCMS SIC (classification) codes and proposing improvements. 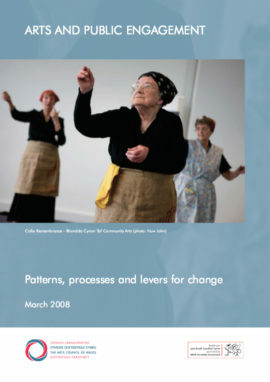 Eight arts and cultural organisation in Liverpool surveyed audiences and visitors about the impacts of their experiences over the 2009 – 2010 season. Widely adopted breakdown of arts audiences into thirteen different “segments” for marketing use by organisations and local authorities. 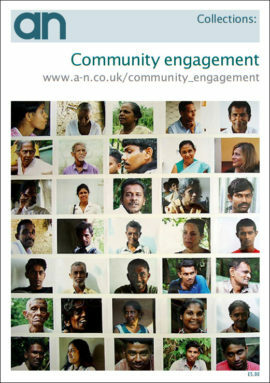 Evaluation to assess impact of the programme in ten pathfinder areas between 2008 and 2011. 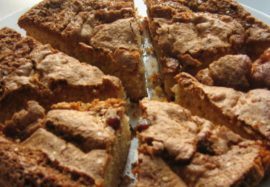 Whose cake is it anyway? 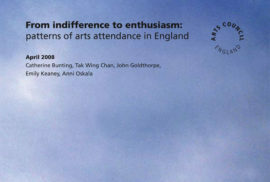 A collaborative investigation into engagement and participation in 12 museums and galleries in the UK, from 2011. A joint Local Authority, Arts Council and Royal Society for the Arts (RSA) project focused on enhancing the town of Peterborough, through a variety of interventions aimed at stimulating citizen power, attachment to place and innovation amongst residents in Peterborough. Two part document, consisting of conversations with participants of arts projects in North Liverpool, and an in-depth discussion of LARC supported art-interventions in the same city area. 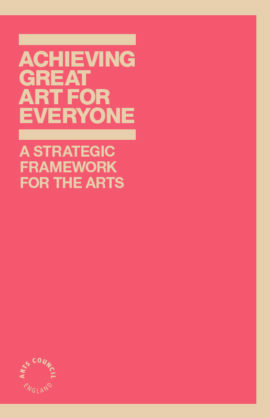 A strategic framework for the arts. 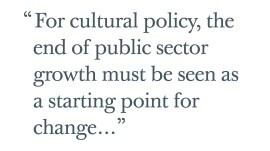 Overarching comments on behalf of the visual arts sector in the UK responding to new ACE policy in 2010. 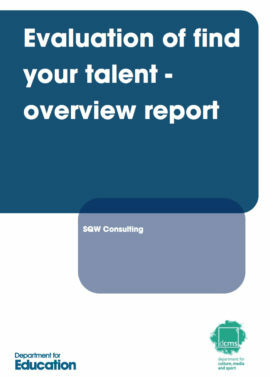 Overview of findings from the Taking Part survey of 2008-09. Joint Demos and CASE (Culture and Sport Evidence Programme) fellowship essay examining evidence in relation to public participation in culture and sport. Addresses the question: why should the state get involved in culture, and if it should, how? 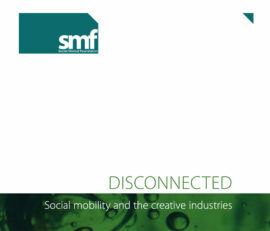 Explores the barriers preventing greater equality of access to the creative and cultural sector. 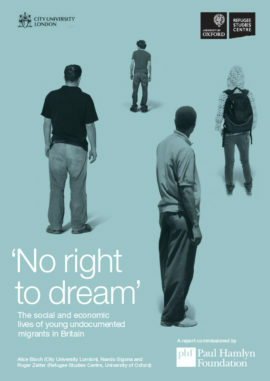 Paul Hamlyn commissioned long report into the life experiences of young undocumented migrants in the UK. Findings from the first three years of the Taking Part survey. Catherine Wilson explores the myriad ways artists can engage with specific communities via residencies, collaborations, cross-cultural projects and research. 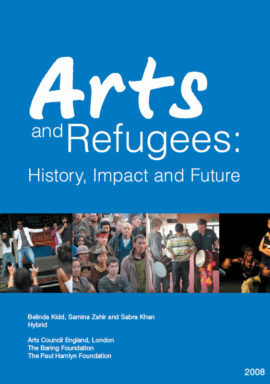 Joint report issued by three funders of arts work with refugees, recording and analysing the work from 2000 – 2008. 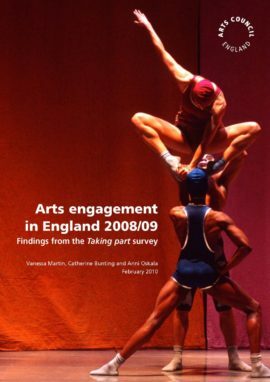 Including 2008-09 statistics, this analysis of Taking Part survey data on arts attendance in England is produced in partnership with Tak Wing Chan and John Goldthorpe from the University of Oxford. 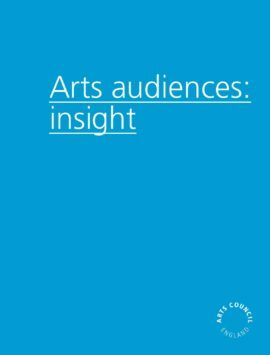 Following a decline in arts participation, Arts Council Wales commissioned this report to understand the reasons. 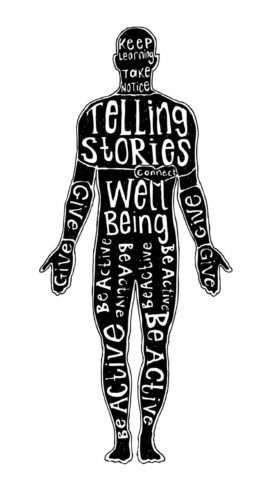 An index of visual arts research, cultural policy, strategy and commentary collated from organisations across the UK creative sector. a-n offers a range of memberships for individuals and groups – from £38 annually – find out more. Members can sign up to e-alerts and choose how often they want to receive them.